The ULR5 GPS solution is the result of a reanalysis of 16 years of GPS data from 1995 to 2010. Its vertical velocity field is published in Global and Planetary Change. It is expressed in ITRF2008. The GPS velocities were obtained in the final step of the analysis which combined the weekly GAMIT/GLOBK global network solutions (station coordinates with full co-variances) from the entire data time span into a long-term solution using CATREF software. This long-term solution (ULR5) was aligned to ITRF2008 using minimal constraints over a selected set of IGS Reference Frame stations. A detailed description can be found in the reference below. The ULR5_detrend.zip file contains individual station data files of weekly residual position time series in ITRF2008 with respect to the linear long-term combined solution at the reference epoch. These residuals (detrended and deseasoned) are expressed in meters in the local frame (North, East, and Up). The reference position and the 3D velocity in the local coordinate system (East, North, Up) are provided in the header of each file. 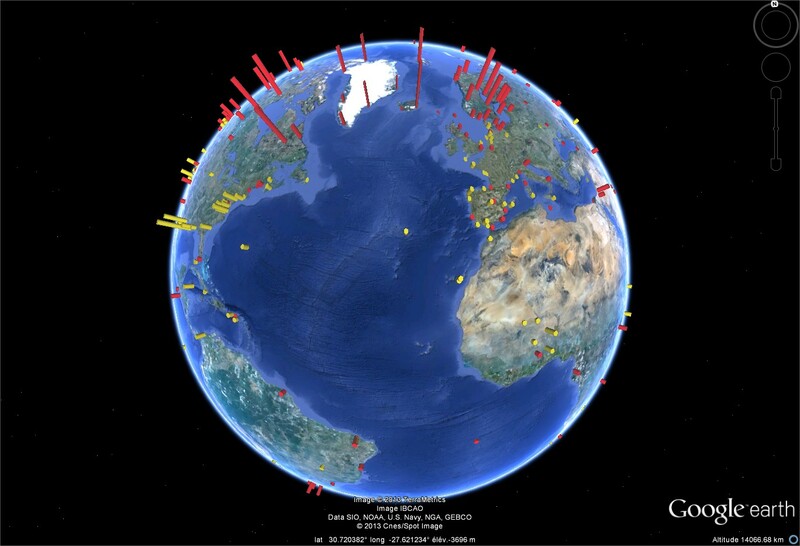 The ulr5.kmz file shows a Google Earth presentation of the above weekly data files by cliking on a station symbol. The associated IGS-like sitelog can be accessed too, as well as a plot of the residual position time series in the vertical. The ULR5_discontinuities_Table.txt file provides the position offsets that were estimated. The ULR5_Vertical_Velocites.kmz file shows a Google Earth presentation of the ULR5 vertical velocities. For each GPS station a vertical cylinder whose height is proportionnal to the estimated velocity is drawn ( yellow for subsidence, red for uplift). A. Santamaria-Gomez, M. Gravelle, X. Collilieux, M. Guichard, B. Martin Miguez, P. Tiphaneau, G. Wöppelmann (2012) : Mitigating the effects of vertical land motion in tide gauge records using a state-of-the-art GPS velocity field. Global and Planetary Change, Vol. 98-99, pp. 6-17.